Miecislaus Haiman, a historian of Polish immigration to America, divides the flow of Poles to the New World into three general time periods: 1608-1776, 1786-1865, 1865-present. The circumstances stimulating emigration from Poland varied significantly between these eras, and the goals of immigrants in each movement, likewise differed significantly. Many legends allegedly purport the participation of Polish explorers in the early exploration of America. Most, if not all, however, lack the substantial historical documentation to be considered seriously. In 1476, for example, some sixteen years before Columbus discovered America, a Danish expedition left Copenhagen, commissioned by King Christian I to sail in a westerly direction to discover the Old Norse colonies in Greenland. In addition, the expedition was to seek a new route to East Asia which was the desire of most European rulers and seamen. The flottila reached Greenland but did not find the Old Norse Colonies, and it returned to Denmark. While unsuccessful in accomplishing its primary objective, there is some historical data that suggests the expedition discovered Labrador and sailed as far south as the Delaware River before returning to Cophenhagen. Polish immigrants to America between the years 1608 and 1776 were generally adventurers, and their numbers were few. The Old Polish Nation never needed libensraum, i.e., "elbow room," due to overpopulation. In fact, Poland was often a destination for migrating peoples, viz., Germans, Jews, and Scots from Western Europe and the Armenians and Tartars from the East. Moreover, coterminous with the commencement of North American colonization, she was involved in defensive wars with Russians, Swedes, Turks, Tartars, and Cossacks throughout the 17th century. Exhausted by the wars and seriously weakened economically, Poland languished under her 18th century monarchs, the Saxon Kings. Such national malaise inhibited significant emigration. Poland's abundant forests and the expertise of her people in lumbering and associated industries were well-known in England. Forced to import enormous quantities of wood and wood products from foreign sources in order to offset the depletion of native resources, England relied upon Poland perhaps more than other countries. Captain John Smith, leader of the Virginia Company, previously had dealings with the Poles and knew of their enterprising ways. The Virginia Company hired Poles as experts and instructors in the manufacture of the products which England was so dependent on from Poland, viz., glass, pitch, and tar. A small group of six landed with the expedition on October 1, 1608: Zbigniew Stefanski--glass production expert; Jan Bogdan--pitch, tar, and ship construction expert; Jan Mata--soap manufacture expert; Michael Lowicki--nobleman; and Stanislaus Sadowski and Karol Zrenica.8 Soon after their arrival, these artisans constructed a glass furnace a mile from Jamestown. Cutting down trees in the area, they also began the first wood products manufacturing center. They worked so industriously that within three years the Poles were able to repay the Virginia Company for their passage and become free citizens of the Jamestown colony. The Poles continued to manufacture wood products in Virginia until 1622. Between 1608 and 1622, however, their relations with the English periodically soured and their vital work halted. Production on occasion was halted because the colony disfranchised the Poles. Possessing a keen sense of freedom and civil liberties, the Poles considered disfranchisement an affront to their sense of justice and liberty. On June 30, 1619, the Virginia House of Burgesses instituted a representative form of government which granted only those of English descent the right to vote. Automatically disenfranchised, the immigrants were incensed. In response, the Poles suspended operations in their glass factory, tar distillery, and soap factory.9 By withholding their labors, the Poles were able to exert powerful economic pressure; most of the cash products with the highest profits to the London Company were provided by the Polish industries. Governor Yeardly and the Virginia legislature readily reversed their decision, righting a political wrong perpetrated against the Poles. Poles were adventurous frontiersmen also; most prominent among them was John Sadowski. Settling at first in Philadelphia, he was the first Pole to venture across the Alleghenies. Sadowski was well-known as an Indian trader and interpreter prior to his trip west. In 1735 he crossed the Alleghenies into Ohio, Kentucky, and Tennessee and was one of the first white men to explore and settle in this region. His sons, Jacob and James, followed in their father's footsteps and were instrumental in the exploration of what is today Kentucky and Tennessee. The second era of Polish migration, 1776-1865, involved a considerably larger group of people. Political unrest and the ultimate partitions of Poland by her neighbors--Prussia, Russia, and Austria--were the stimuli to emigration in these years. Most of the Polish emigrants were prominent noblemen and intellectuals who had participated in the defense of the Old Order. Among them were such notables as Thaddeus Kosciuszko and Casimir Pulaski. It was clearly a different type of Pole who left his homeland at this time. Unlike their predecessors, they were men of distinction and prominence: soldiers, noblemen, poets, educators, and musicians. Since Poland was not extant during the Revolutionary War, there were no "official relations" between Poland and the United States. For it was at this time when the outbreak of the Revolutionary War occurred, that Poland herself had lost much of her international prestige due to the invasion of the Swedes, Turks, Russians, Cossacks, and Tartars. He went on to say that without representation conflicts of interest would occur which would not benefit either country. Furthermore he felt that an injustice might occur in America similar to that in Poland. Pulaski was also instrumental in preventing the loss of Charleston, South Carolina. The British were close to the city and advancing rapidly. The army commander, General Prevost, demanded that Charleston surrender. In the midst of the negotiations, Pulaski unexpectedly appeared and vowed to defend Charleston. Pulaski's fame and success of the Legion "had considerable influence in dispelling the general panic, and introducing military sentiments into the minds of the citizens. "34 Prevost was forced to withdraw and the city remained under colonial control. 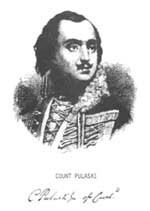 Recognized historically as the "father of American cavalry," Pulaski's skill and courage as a commander were invaluable assets to the all too often demoralized and inept Continental Army. Of all the Polish officers who participated in the Revolutionary War, he is considered the most romantic, and professionally, the most prominent.35 A spirited soldier, he embraced the colonial cause as his own: "I could not submit to stoop before the sovereigns of Europe, so I came here to hazard all for the freedom of America. "36 Although many brave men served America throughout the Revolutionary War, Pulaski was special. Another Pole who joined in the American service was Kotkowski (Kolkawski, Kotskoelski). He was highly recommended by Pulaski and consequently was commissioned Captain of the Legion by Congress. There were many other less notable officers who fought in the American War for Independence, such as Kraszewski, Charles Litonski, and Matthias Rogowski, to name a few. Morphi's plan was rejected. Spanish authorities knew the Poles looked to Napoleon as "the only power on earth that could restore their own unhappy country to freedom. "46 Moreover, it was feared that the settlement of foreigners on the frontier would jeopardize Spain's interests and that the Poles would, ultimately, aid the United States if a conflict arose. The disorganization of European societies caused by the Napoleonic wars and mass migrations at their end affected America also. Many of Napoleon's soldiers, as well as dislocated peoples, entered the United States. The rapid growth of Texas's population caused the Mexican rulers to become concerned and suspicious of the Americans., Recognizing the American influence and fearful of a possible loss of their territory, Mexican authorities began to enforce new and old laws such as abolishment of slavery, imposition of taxes, interference in local affairs, and apprehension of colonists. These laws led to a revolution in 1835. After the defeat of Fannin's army, Santa Anna, the Mexican President was able to capture the Alamo. However, his victory was short lived. Felix Wardryski (Wardzinski), under the command of General Sam Houston, defeated him at San Jacinto. The Mexican army retreated and Santa Anna was captured and taken prisoner. In California, Spanish authorities were extremely apprehensive and resentful of strangers entering their land. Consequently, if a ship was forced to undergo repairs on their shores, it was immediately captured along with the cargo. American sailors, therefore, became cautious and welcomed sites that were isolated and peaceful to repair their ships. So it happened that William Shaler and Richard Cleveland, merchant-adventurers of New England, discovered a site on Catalina Island where they could safely make rush repairs. This area was yet unnamed. Hence, Shaler and Cleveland christened it Port Rouissillon. Who or what was Rouissillon? Rouissillon was said to have been a member of an "ancient noble family of Poland," a strong believer in individual liberty who rejected the disciplined life of his native land. He became acquainted with Shaler and Cleveland in Hamburg, Germany. Although his name is not even mentioned in the geography of California, it has been assumed that he was a Polish count living incognito. With this disguise, so to speak, he was able to avoid any encounters that might have occurred with enemies. California attracted many Poles during the 1840's and 1850's. Earlier settlers were immigrant veterans from Polish uprisings, while the period of the gold rush "became the spark which released the great influx of the Polish Peasant or economic immigration to this country." among the soldiers in his official report. The Fifty-Eighth Regiment, he emphasized, "behaved with great gallantry under the command of Colonel Krzyzanowski." Later in the year, Krzyzanowski was made commander of the Second Brigade, Third Division, a combined infantry and artillery unit once again. He was responsible for the Fourth and Fifty-Eighth New York, Seventy-Fifth Pennsylvania Infantry, and a battery of the second New York Light Artillery. Active in the battles at Fox Ford, Sulpher Springs, Waterloo Springs, and Govenon, Virginia,54 Krzyzanowski's Division also fought furiously and successfully at the Battle of Bull Run. "The gallantry with which Colonel Krzyzanowski on the left wing withstood and repelled the frequent and fierce assaults of the enemy," declared General Carl Schurz," commands the highest praise." President Lincoln, in addition, nominated him for promotion to the rank of brigadier general; however, the Senate refused to ratify this request. Apparently Krzyzanowski felt little resentment or anger at this injustice, and he continued to fight for the Union until the War ended. The Poles who were fighting in the Union and Confederate armies were men of high ideals. Their military experience was of much value since most were commissioned officers as well as veterans of wars for freedom of past decades. who defeated the Confederates at Rock Hills in 1861; and Major Gaspard Tochman and Colonel Valery Sulakowski of the Confederate army. The immigrants attracted to California's gold were the harbingers of the third migration movement from Poland, beginning in 1865 and lasting until the United States imposed legislature restrictions on immigration in 1920. This was the era of the Polish peasant. Economically desperate, peasants in Europe had been ravaged by the concerted and unrelenting efforts of Russia, Prussia, and Austria to eliminate political opposition in the Polish sectors of their respective empires.55 Jobs, high wages, and relief from crushing taxes were dreams the peasant cherished as he considered emigration. The lack of or limited increase in educational standards and opportunities, along with linguistic and religious persecutions initiated by Bismarck's Kulturkampf policy served as an impetus for Polish emigration from Prussian Poland. Polish emigration from Russian Poland which commenced in 1876 was due in the main to a crop failure, high rate of unemployment in the textile industry due to labor problems, and the institution of universal military service. on the other hand, was in great need of his muscle, i.e., manpower to labor in its ever expanding industries. So, it can be seen that emigration and immigration were reciprocal processes which complemented each other to the betterment of the Polish immigrant as well as the American nation. World War I halted the flow of Poles to the United States, at least for the duration of the hostilities. Many Polish-Americans hoped that the defeat of Germany would bring about a restoration of their homeland. Supporting the United States' intervention in the war, they patriotically worked to assure an American victory. 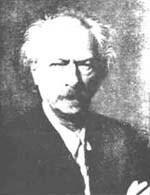 The prominent pianist, Ignace Paderewski became the informant for his country and came to America in 1915. Wherever and whenever he could, he visited the large cities and spoke of his country's situation. It was his hope to free a country he loved by acquainting the American public with the existing conditions.67 Paderewski's sincere approach to the American-Poles made his appeals successful. The years 1914 to 1916 saw the slow progression which eventually led to the United States intervention. In the beginning, this involvement was emotional and, later, became economic. During this time Paderewski appealed to the Polish Falcons for their help to recruit a Kosciuszko Army to fight alongside the Americans. The Falcons unanimously voted in favor of Paderewski's suggestion when War was officially declared on April 6, 1917. This Kosciuszko Army grew to 100,000 men of which 28,000 were volunteers from the United States and others were prisoners of the Central Powers. They were under the command of General Jozef Haller. Because of the victory which gave Poland her independence, the American Poles gained much prestige. They became more conscious of their heritage and developed outstanding Polish cultural institutions for the preservation of their heritage. Shortly after the German attack on Poland and the bombing of Warsaw, appeals were made to gain the support of the American Poles and their descendants similar to those made at the outbreak of World War I. During a second tour through the United States, Sikorski's appeals to the Poles were filled with sarcastic remarks which accused the Poles of neglecting their homeland. Because of his remarks, Sikorski's cause was lost. Moreover, the American Poles retaliated in an anger which was shocking. Now there existed an obvious attitudinal change among the American Poles quite different from what was felt in World War I. The PNA (Polish National Alliance) stated in their newspaper the "Alliance Daily": "We have our own problems." The concern for Poland was much less than it was in the past. The greater concern was now for America and her war problems.73 Polish Americans not only enthusiastically supported President Roosevelt's action on behalf of the anti-axis powers, but also enlisted in great numbers in the military. Over 900,000 Poles were in the Armed Forces in World War II. Army and Navy records list 20 percent as American Poles. The names of Poles were heard throughout the Marine Corps, Army and Navy, as well as the WACS, SPARS, and WAVES. Throughout the United States recruiting offices stated that 50 percent of their volunteers were of Polish descent and were "among the first to enlist." Some of the men who attained the rank of General in World War II were: John Wisniewski, Joseph Berzynski, and John Rataj. Americans of Polish ancestry contributed to war efforts heavily. The Polish National Alliance and the Polish Roman Catholic Union purchased enough United States bonds to cover the cost of five bombers; all the planes were given Polish names. They also contributed generously to service organizations and organized special committees to aid both war victims of Poland and Polish refugees. More than ten million dollars was contributed to alleviate the suffering. They also provided additional means for religious services for needy war victims. By the end of the war about ten million were left homeless in Europe. They were labeled Displaced Persons or D.P. 's, and were given shelter in camps which were headed by the occupying armies and under the advise of the United Nations Relief and Rehabilitation Administration (UNRRA). It was anticipated that the countries of Australia, Canada, New Zealand, and South Africa, would eventually absorb them. The Commission for the Displaced Persons stated on January 2, 1952 that over 300,000 had entered the United States at a cost of $100,601,000 thus giving residence to more persons than any other nation. 1Miecislaus Haiman, Polish Past in America 1608-1865 (Illinois: The Polish Roman Catholic Union, Archives and Museum, 1939), pp. 5-6. 7Joseph A. Wytrwal, America's Polish Heritage: A Social History of Poles in America (Detroit: Endurance, 1961), p. 21. 8Miecislaus Haiman, Poles in America 1608-1865 (Chicago: The Polish American Congress, 1958), p. 18, citing the Jamestown Pioneers from Poland. 9Wytrwal, op. cit., pp. 22-23. 10Haiman, Polish Past in America 1608-1865, op. cit., pp. 16-17. 11Wytrwal, op. cit., pp. 24-26. 13Paul Fox, The Poles in America (New York: Arno Press and the New York Times, reprint, 1970), p. 36. 14Oscar Helecki, A History of Poland (New York: Roy Publishers, 1956), p. 163. 15Fox, op. cit., p. 36. 21Ibid., pp. 11-13, citing H.E. Hayden (Wilkes Barre: Virginia Genealogies, 1891), pp. 395-420. 22Haiman, Polish Past in America, op. cit., p. 29. 23Wytrwal, op. cit., pp. 36-38. 25Haiman, Poland and the American Revolutionary War, op. cit., p. 37. 26Wytrwal, op. cit., p. 37. 27Wytrwal, op. cit., p. 37. 28Haiman, Poland and the American Revolutionary War, op. cit., p. 27. 32Haiman, Polish Past in America, op. cit., p. 38. 33Haiman, Poland and the American Revolutionary War, op. cit., p. 30. 35Wytrwal, America's Polish Heritage: A Social History of Poles in America, op. cit., p. 40. 37Haiman, American Revolutionary War, op. cit., p. 35. 39Ibid., p. 39, citing J. Johnson, Traditions and Reminiscences Chiefly of the American Revolution in the South (Charleston: 1852), p. 246. 43Miecislaus Haiman, The Poles in the Early History of Texas (Chicago, Illinois: Polish Roman Catholic Union of America, 1936), p. 19. 52Joseph A. Wytrwal, America's Polish Heritage: A Social History of Poles in America, op. cit., p. 65. 53Joseph A. Wytrwal, Poles in American History and Tradition (Detroit, Michigan: Endurance Press, 1969), pp. 151-152. 55Haiman, Polish Past in America 1608-1865, op. cit., pp. 3-4. 61Wytrwal, America's Polish Heritage, op. cit., p. 128. 62Fox, op. cit., pp. 44-45. 64Wytrwal, Poles in American History and Tradition, op. cit., p. 216. 67Wytrwal, Poles in American History and Tradition, op. cit., pp. 325-329. 70Wytrwal, Poles in American History and Tradition, op. cit., p. 334. 74Wytrwal, Poles in America, op. cit., p. 64. 75Wytrwal, Poles in American History and Tradition, op. cit., pp. 412-413. Coulter, Charles W. The Poles of Cleveland. Ohio: Cleveland's Americanization Committee; Mayor's Advisory War Committee, 1919. Fleming, Thomas J. The Golden Door, The Story of American Immigration. New York: Grosset and Dunlap, Inc., 1970. Fox, Paul. The Poles in America. New York: George H. Doran Company, 1922. Groisser, Philip L. Mastering American History. New York: Keystone Education Press, 1967. Haiman, Miecislaus. 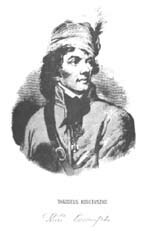 Kosciuszko: Leader and Exile. New York: Polish Institute of Arts and Sciences in America, 1946. -----. Poland and the American Revolutionary War. Illinois: Polish Roman Catholic Union, 1932. -----. Polish Past in America 1608-1865. Illinois: The Polish Roman Catholic Union, 1939. -----. Polish Pioneers of California. Illinois: Polish Roman Catholic Union, 1940. -----. The Poles in the Early History of Texas. Illinois: Polish Roman Catholic Union, 1936. Halecki, Oscar. A History of Poland. New York: Roy Publication, 1956. Katz, William Loren. Slavery to Civil War 1812-1865. New York: Franklin Watts, Inc., 1974. Lerski, Jerzy Jan. A Polish Chapter in Jacksonian America: The United States and the Polish Exiles of 1831. Wisconsin: The University of Wisconsin Press, 1958. Levy, Donald. A Report on the Location of Ethnic Groups in Greater Cleveland. Cleveland: The Institute of Urban Studies, Cleveland State University, 1972. Mann, Arthur. Immigrants in American Life. New York: Houghton Mifflin Company, 1968. Martin, Michael and Leonard Gelber. Dictionary of American History. New Jersey: Littlefield, Adams and Company, 1966. Pap, Michael S. (ed.). Ethnic Communities of Cleveland. Ohio: Institute for Soviet and East European Studies, John Carroll University, Cleveland, 1973. Reddaway, W.F. et. al. (ed.). The Cambridge History of Poland--From Augustus II to Pilsudski 1697-1835. Great Britain: Cambridge at the University Press, 1941. Thomas, William and Florian Znaniecki. The Polish Peasant in Europe and America, Vol. I. New York: Alfred A. Knopf, 1927. -----. The Polish Peasant in Europe and America, Vol. II. New York: Alfred A. Knopf, 1927. Wieczerzak, Joseph W. A Polish Chapter in Civil War America; The Effects of the January Insurrection on American Opinion and Diplomacy. New York: Wayne Publishers, Inc., 1967. Wytrwal, Joseph A. America's Polish Heritage. Michigan: Endurance Press, 1961. -----. Poles in American History and Tradition. Michigan: Endurance Press, 1969. -----. The Poles in America. Minnesota: Lerner Publications Co., 1969. More than 4 1/2 million Poles have settled permanently in the United States. They came at different times, for different reasons and from different backgrounds and circumstances which affected where they settled in the United States. Up to the 1900's, about 18% of the total arrived; from 1901-1914 about 59%; from 1914-1950 about 23%, with the peak year in 1921. Arrivals since then have been under the rigid quota system and have been minimal. Up to 1883 about 95% of America's immigrants came from Northern and Western Europe. The earliest Polish settlers, although only a handful, were prosperous businessmen, adventurers and political exiles. Outside of Jamestown, the earliest settlements were in New York, Louisiana, and Pennsylvania, and the immigrants found employment on individual farms, plantations and in businesses. Polish immigrants, like many others, often had romantic visions of reestablishing their old homeland in America. This was especially true of exiles from a land partitioned by Prussia, Russia and Austria, where their only means of identity was a language and a religion. In 1834, a group of exiles from Austria illustrated this desire. In a petition to the Congress they asked for land in Illinois to establish a new Poland. The petition was granted, but the land was ultimately abandoned and the original political exiles settled in New York, Albany, Philadelphia, Boston and the Midwest. under the direction of the Franciscan Father Leopold Moczygemba. These hardy Silesians, consisting of around 800 men, women and children, had to contend with hardships that were completely foreign to their background; ultimately many left and settled in San Antonio, St. Hedwig and Yorktown. In 1855, a family from West Prussia settled in Portage County, Wisconsin and founded Polonia which eventually grew to a prosperous rural community. The Polish population of Wisconsin continued to grow and by 1885 the state had the largest number of Polish residents in the United States. Patterns of settlement shifted after 1885, and other states rapidly caught up and passed Wisconsin in the total number of Polish residents. Polish immigrants in America tried to reconstruct, as far as possible, the primary social system of the old country. They settled in compact masses, where rent was low and land was cheap, and established communities in which they could build a church. By 1860 at least 30,000 Poles lived in America scattered throughout the thirty-four states and seven territories comprising the Union. Poles fought for both the South and the North. After the Civil War, American railroads imported Polish immigrants to Illinois, Nebraska and Iowa to settle in agricultural and mining colonies. The Burlington-Missouri Railroad, alone, moved 300 families to Nebraska in 1877 to land that it had acquired by Congressional land grants and resold to the Poles. At least one-third of the total Polish immigration ventured into farming; some in the South, some in the Midwest and the others scattered over the Northwest. Poles had been recruited to work on tobacco and vegetable farms as early as 1870. With their knowledge of the land, they restored hundreds of thousands of depleted acres to high-grade yield again. Wherever they settled, they were highly praised as farmers. By 1911, 90% of the foreign born Polish farmers and 55.7% of Polish agricultural laborers resided in ten states: Michigan, Wisconsin, Texas, Nebraska, Illinois, Indiana, New York, North Dakota, and South Dakota. Of this number, 63.4% resided in the states of Michigan, Wisconsin and Minnesota. Migration" brought enormous numbers to the cities, settling wherever cheap labor was needed. Four-fifths of the immigrants who came after 1880 stopped within the great urban triangle formed by St. Louis, Washington and Boston. Many immigrants got no further than their first stop, New York City. Thousands settled on the Lower East side, living in crowded tenements and working in the garment industry. The largest concentration of Poles is still to be found in New York City. The constant growth of population was absorbed within the existing communities causing sanitary problems as apartments were divided and subdivided. This continuous flow of immigrants had a subtle change which was particularly critical at a time when the native birth rate was beginning to fall. Poles went to the cities because of their own economic needs and the demands of industrialization, not because they were urban folk. They found employment wherever they could; they were forced to go into the mills and down into the worst mines. Poles were often disliked and feared by their English-speaking counterparts because of their determination and hard work. They were manipulated and swindled by employers who were hungry for profit. In desperation and for protection, Poles formed tighter and tighter groups that others called a ghetto and the Poles knew as "home." Industrial growth and the increasing demand for labor centered along the eastern seaboard and followed the railroads across the Midwest. Poles followed these paths, too, employed mostly as unskilled laborers. There was no industry in which they were not represented, but most were either in manufacturing or mining industries. Since the earliest arrivals were husbands and sons, outnumbering women two to one, they often accepted the most menial jobs to raise the necessary funds to bring their families over. With the arrival of wives and children, the need for better wages, and a concern for better living conditions, pushed the Poles to an equal level with their English-speaking workers. The arrival of most of the Polish immigrant families made the Poles realize the need to organize, and they began to look closely at the unions.9 By 1887-88, they were heavily employed in the anthracite coal mines of western Pennsylvania and they were poorly paid. Whether in 1887, 1897, or 1902 no Pole dared object to supporting the strike because of the pressure of the group, and few could live outside in the isolation of "Yankeedom." Wages in the coal industry were always low. New factories like those in Cincinnati and Cleveland attracted immigrants, employing skilled and unskilled laborers. The leading centers of Polish growth were Chicago, New York, Detroit, Buffalo, Cleveland and Philadelphia. By 1910 Poles were the largest number of workers in Midwestern industries and mining. In addition, Polish immigrants worked in the steel and iron industries in Akron, Youngstown and Toledo, Ohio; Gary, Indiana; Pittsburgh, Pennsylvania; Patterson, New Jersey; and in the Ford factories in Detroit. They were heavily employed in the textile mills of New England: the 1903 census showed 600 Poles in Lawrence, Massachusetts, and by 1910 the number had increased to 2100; there were between three and four thousand Poles in New Bedford in 1910. They were also employed in cloth manufacturing in Baltimore, but in much smaller number. Poles worked in glass factories in Mississippi, Illinois, Indiana, Ohio, New York, New Jersey and Maryland. In Milwaukee they worked in the leather industry. In Chicago they were primarily employed in the slaughtering and meatpacking houses. Polish community growth and cohesion were maintained through language, religion and especially its social aspects, the desire for independence and rapid intro-community organizational growth. The exile of the Jesuits from Poland in 1872 brought priests to America who could speak Polish and who had the education and the capability of forming cohesive groups. By necessity, Poles worked in situations where no Polish was spoken. To combat loneliness and the strangeness of American customs, unity with fellow Poles was cherished. Desires to unite all Polish Americans brought about the development of national organizations for the betterment and the support of the Polish community in the United States. Since the primary focal point for community organization had been the parish church, it naturally followed that the first national Polish organization evolved from the efforts of a priest. Father Gieryk of Detroit formed the Polish Roman Catholic Union in 1873. It was followed by the Polish National Alliance in 1880 which later became the strongest Polish fraternal organization in America. Another group that was formed for the well being of the Poles was the Polish American Congress. The Association of Polish Women, with similar goals and purposes as the Polish Roman Catholic Union, was formed by the women. Document 140 enumerates the organizations connected with the largest Polish parish in America, St. Stanislaus Kosta, in Chicago. This one parish, alone, had 74 different organizations. that is, "civilizing" them by demanding conformity to American Catholic doctrine, ritual and leadership. These attempts to assimilate the Poles periodically created feelings of contempt for everything Polish in some immigrants and their children, and to rejection of their Polish heritage by changing their names to hide their Polish past. The situation created social problems within the home and the church, and a gap between the younger and older generations grew. The use of Polish language was abandoned in some parishes and some Polish parochial schools eliminated Polish language instruction from their curricula. Despite such serious problems, the Polish American community was maintained. Poles received little assistance in their efforts to find solutions to the problems of assimilation and isolationism. Tragically, they felt themselves caught between being poor citizens and poor Catholics, or Poles. Some of the foreign born chose to sever relations with their parish and Polish Catholic heritage. Others fell away from the church and joined Protestant denominations. An independent religious denomination, the Polish National Catholic Church in America, was organized by other immigrants under the leadership of Reverend Francis Hodur. The majority, however, chose to remain Polish Catholic and to remain a distinct group within the American environment. No more than their parents, however, have the children and grandchildren of the Poles assimilated in any great numbers. The Quota Acts of 1920 and 1924 affected the settlement patterns of the Poles. Both the disappearance of the strong primary group contact with Poland and the rapid decline in immigration made Poles acutely aware of their American status. They started to interact more with American institutions. The institution that most affected this change was the school: the higher the education the more likely they were to change their name and move to a better residential area. Yet, as Stanley Lieberson found in his study of ethnic patterns in cities, while "residential segregation from the native-white population declined through time" because of the higher rate of interaction, there was still a "remarkably high degree of segregation among ethnic groups. "27 Recency of arrival, he discovered, was the most important factor in influencing segregation from the general population. This concurs with other research that the second and third generation were more inclined to seek upward mobility than their parents, but that identity and community integrity persisted as indicated by the active and vital force of the parish for the majority of Poles.28 Interviews with the pastors of 546 parishes showed that the parishes were still ethnic in varying degrees. Yet the data also found significant discrepancies in Wisconsin and Illinois. Such changes in residential patterns occurred, in part, because of competition for housing arising from the urban migration of Negroes and poor whites and their competition in the work force as cheap labor. The Quota Acts of the 1920's and the Depression of the 1930's stablized the Polish settlements for the first time in their history. During the first decades of the 20th century, most Poles were laborers, but their children began to see the necessity of a higher education. In the 1930's, poor and middle income farmers, regardless of background, were drawn to the agricultural programs of the New Deal. The Poles fared the Depression as well as any other group, and probably better, because of their attachment to the land. Small gardens have always been a part of a Polish community, and in the crisis they "lived off the land" meager as it was. This was true of 1) professional, technical and kindred workers; 2) managers, officials and proprietors; 3) clerical and kindred workers; 4) sales workers; and 5) craftsmen, foremen, and kindred workers. They ranked below the national average percentagewise in four categories: 1) operatives and kindred workers; 2) service workers; 3) farm workers and foremen; and 4) laborers - the field in which they were found predominantly in earlier decades. With the exception of New York City, there is a high degree of continuity with early settlement patterns, and for all its social problems, even New York City has a high rate of stability. Such gains are impressive when they are measured in the context of hostility represented by the Americanization movement. Education also challenged "the traditional endogamous values of the ethnic culture, as well as increase the opportunities to meet and marry someone from a different ethnic background. "37 Education has influenced contemporary marriage patterns among Catholics. With some high school or less, 42 per cent of the Catholics married out of the ethnic group. For Catholics who graduated high school or attended college, the rate rose to 57 per cent. There was no significant difference between public and parochial school backgrounds. educated and upper-middle class, only a few unskilled laborers arrived. Most had the capital and resources to fulfill American admission requirements. If they had no capital, they had a skill to offer that was needed and were guaranteed a job upon arrival. These new groups and individuals were readily resettled because of the agencies prepared to help them with resettlement, and they never experienced the difficulties of their predecessors. to midnight mass. It's cold, the snow is blowing. I see my neighbor, I say, "Merry Christmas!" The sonuvabitch walked right past! If he was Jewish I could understand it, but one Catholic to another! 1Rev. V. Jasinski, Introduction to The Contribution of the Poles to the Growth of Catholicism in the United States (Rome: Sacrum Poloniae Millenium, 1959), Vol. VI, p. 13. 2Sister Lucille, C.R. "Polish Farmers and Workers in the United States to 1914," Polish American Studies, XV, (Jan.-June, 1958), p. 2. 3Joseph Wytrwal, America's Polish Heritage (Detroit: Endurance, 1961), p. 86. 4Sister Lucille, C.R., "The Causes of Polish Immigration to the United States," Polish American Studies, III, 1951, p. 85. 5Joseph Parot, "Ethnic versus Black Metropolis: The Origins of Polish-Black Housing Tensions in Chicago," Polish American Studies, XXIX, 1972, p. 7. 6Leonard Chrobot, "The Polish American and Immigration," unpublished manuscript submitted to Harcourt Brace Publishers, 1973. 7Oscar Handlin, et al., The Positive Contribution by Immigrants (Paris: UNESCO, 1955), p. 22. 8Maurice R. Davie, World Immigration (New York: Macmillan Co., 1939), p. 28. 10Victor R. Greene, "The Poles and the Anthracite Unions in Pennsylvania," Polish American Studies, XXII (Jan.-June, 1965), p. 12. 11Oscar Handlin, et al., op cit., p. 21. 12Thomas and Znaniecki, The Polish Peasant in Europe and America (New York: Alfred A. Knopf, 1927), p. 201. 14Theresita Polzin, "Social and Economic Conditions," The Polish Americans, Pulaski, Wisconsin: Franciscan Publications, 1973, p. 119. 16William Bernard, ed., Americanization Studies, Vol. 3, The Acculturation of Immigrant Groups into American Society, (Thomas, New Jersey: Patterson Smith, 1971), p. 212. 17Joseph Wytrwal, op cit., p. 159. 20Theresita Polzin, The Polish Americans: Whence and Whither (Pulaski, Wisconsin: Franciscan Publishers, 1973), p. 133. 21Stanley Lieberson, Ethnic Patterns in American Cities (Glencoe, Illinois: The Free Press, 1963), p. 72. 22Rev. V. Jasinski, op cit., p. 15. 24Frank Renkiewicz, ed., The Poles in America, 1608-1972 (Dobbs Ferry, New York: Oceana Publications, 1973), p. 102. 25Ellwood P. Cubberly, Changing Concepts of Education (Boston: Houghton Mifflin, 1919), p. 16. 26Rev. V. Jasinski, op cit., p. 29. 27Stanley Lieberson, op cit., p. 45. 28Theresita Polzin, op cit., p. 138. 30Thomas Ford, ed., Social Demography (New Jersey: Prentice Hall, 1970), p. 493. 31Theresita Polzin, op cit., pp. 185-86. 37Harold Abramson, Ethnic Diversity in Catholic America (New York: John Wiley and Sons, 1973), p. 87. 42Maryanne Conheim, "He Lives in Warren and Wonders if Being Worth $150,000 Means Anything," Detroit Free Press, Aug. 6, 1972. 43Harold Abramson, op cit., p. 173. Abramson, Harold. Ethnic Diversity in Catholic America. New York: John Wiley and Sons, 1973. Bernard, William, ed., Americanization Studies, Vol. 3. The Acculturation of Immigrant Groups into American Society. Thomas, New Jersey: Patterson Smith, 1971. Chrobot, Leonard F. "The Polish American and Immigration," unpublished manuscript submitted to Harcourt Brace Publishers, New York, 1973. Conheim, Maryanne. "He Lives in Warren and Wonders if Being Worth $150,000 Means Anything," Detroit Free Press, Aug. 6, 1972. Cubberly, Ellwood. Changing Concepts of Education. Boston: Houghton Mifflin, 1919. Davie, Maurice R. World Immigration. New York: Macmillan Co., 1939. Divine, R.A. American Immigration Policy, 1924-1952. New York: Da Capo Press, 1972. Feinstein, Otto, ed., Ethnic Groups in the City. Lexington, Mass. : Heath Lexington Books, 1971. Gordon, Milton. Assimilation in American Life. New York: Oxford, 1964. Greene, Victor R. "The Poles and Anthracite Unions in Pennsylvania," in Polish American Studies, Vol. XXII, (Jan.-June, 1965). Jasinski, Valerius. Sacrum Poloniae Millenium, Vol. VI. Rome: Sacrum Poloniae Millenium, 1959. Kennedy, John F. A Nation of Immigrants. New York: Harper and Row, 1964. Lieberson, Stanley. Ethnic Patterns in American Cities. Glencoe, Illinois: The Free Press, 1963. New York Times. July 15, 1948. Novak, Michael. The Rise of the Unmeltable Ethnics. New York: Macmillan Publishing Co., Inc., 1971. Parot, Joseph. "Ethnic Versus Black Metropolis: The Origins of Polish-Black Housing Tensions in Chicago," in Polish American Studies, Vol. XXIX, (Spring-Autumn, 1972). Polzin, Theresita. The Polish Americans. "Social and Economic Conditions." Pulaski, Wisconsin: Franciscan Publications, 1973. -----. The Polish Americans: Whence and Whither. Pulaski, Wisconsin: Franciscan Publications, 1973. Renkiewicz, Frank. The Poles in America, 1608-1972. Dobbs Ferry, New York: Oceana Publications, 1973. Schrag, Peter. The Decline of the WASP. New York: Simon and Schuster, 1970. Stephenson, G. A History of American Immigration, 1820-1924. New York: Russell and Russell, 1964. United States Department of Commerce Publication, 1970 Census of Population: Subject Reports, National Origin and Language. Washington, D.C. 1973. Went, Michael et al. Pieces of Dreams, The Ethnic Worker's Crisis with America. New York: Center for Migration Studies, 1972. Wytrwal, Joseph. America's Polish Heritage. Detroit: Endurance, 1961.